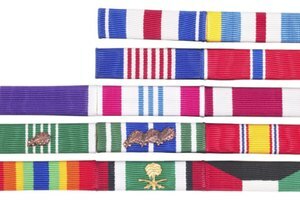 Full-sized medals should be mounted on a fixed bar and displayed in order of prestige. Full-sized medals are the medals worn with the official formal dress uniform of each branch of the military. They consist of a decorated medallion that is fastened to colored ribbon. Each medal is significant of a different achievement, so the number and type of medals worn varies with each person. There are specific guidelines for mounting the medals on the uniform, which are outlined in each branch's uniform regulations. They are mounted on hard mounting bars to keep them from swinging freely and making noise. This follows the full-size court-mounting procedures ordered by Queen Victoria of England. Purchase any replacement medals needed to complete your uniform from local military supplies vendor or a military-approved online vendor. You can refer to your military service record for a list of your achievements. Purchase the mounting bar that is appropriate for the number of medals you need to mount; there are single, double and triple bars for mounting one to three medals and quad-mounting bars for four to 10 medals. You can mount four to seven medals on one quad-ribbon mounting bar, but you will need two quad bars to mount eight to 10 medals. 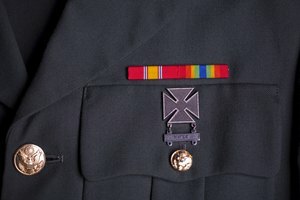 Refer to your uniform regulations to determine the order of your medals, which should be mounted in order of precedence. The most prestigious medal should be mounted and displayed on the top left and the least prestigious should be on the bottom right. Measure the ribbons carefully so you have the right amount of overlap for each medal. Bars with up to four medals with have no overlap, but a bar with five medals, for example, will reveal one-inch of ribbon on each medal, with the innermost ribbon shown in full. Refer to your uniform regulations guide for the exact measurements for each number of ribbons. 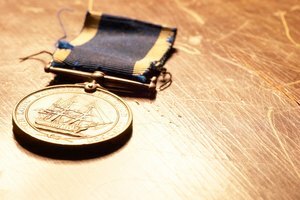 Attach double-sided tape in between the ribbon of the medal's drape to reinforce it and to the mounting bar itself. Slide the medals onto the mounting bars, press to set the adhesive and close with the bar clamp, if your mounting bar includes one. Pin the mounting bar to the left side of your breast, following the exact guidelines of your military branch's uniform regulations. 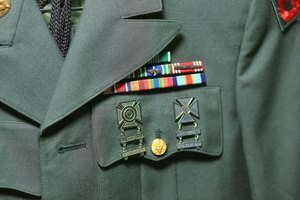 Remember, if you are wearing two bars of medals, the most prestigious medals should be worn on top. 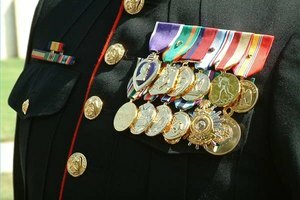 If precision is not your specialty, it may benefit you to pay a professional to mount your medals, especially because improper mounting could get you into trouble with your commanding officer. You can find uniform regulations and order of precedence charts online at several websites. 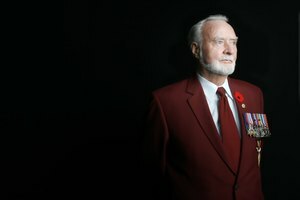 Military medals should only be warn by official members of the military or veterans who have earned the medals. How Do I Wear My Captain's Bars on My Security Uniform Shirt? Allonsy, Amelia. "How to Mount Full Sized Medals." Synonym, https://classroom.synonym.com/how-to-mount-full-sized-medals-13583568.html. 04 October 2017.